What is the Solar Cost of Capital? Whether 8-11% is a good deal for the financier depends on its cost of capital. If a financier’s cost of capital is 10%, the net present value of its investment is essentially zero. On the other hand, if its cost of capital is 5-7%, the NPV of each solar system is several thousand dollars. 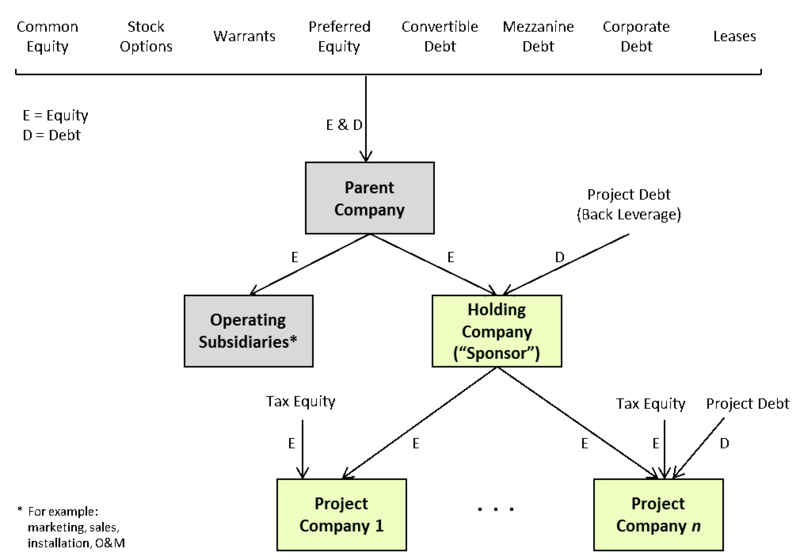 In this post I will first examine the cost of capital for project companies and then for sponsors/holding companies (the green boxes in Figure 1). Twitter will soon go public, but more than 100 companies have completed IPOs in the past six months or so. Many of those newly-public companies have struggled as stocks. They are up an average only 2%, while NASDAQ is up 13% over the same period. Nearly half of those IPO companies are actually trading below their offering price. Most companies that IPO started with venture capital backing. These and other private investors in high-growth companies tolerate of a lot of uncertainty. They value a company’s “story” and have long time horizons. By contrast, public market investors have quarterly, monthly, or even daily time horizons. They hate surprises and value consistency. This is not to say that venture investors have infinite patience, nor that public investors are short-sighted, but that there is a very real difference in the pressures on each of them. The IPO process itself can become all-consuming for management. Preparing forecasts and offering documents and going on roadshows can consume a major portion of management’s time. And, there is tremendous pressure to get the deal done. There may only be a limited time in which the IPO window is open. The board, which typically represents the company’s venture investors, wants a liquidity event. The bankers’ incentives are largely aligned with completing a listing. In this environment there is little time for management to learn about the needs of its new investors. In fact, at the very time the company is shifting from investors who value the long-term outlook to those who value quarterly consistency, management is pulled far away from actually operating the business. Public investors have grown skeptical of IPOs to a degree and are looking to see whether management can meet expectations for several quarters after being public before really committing to a stock. SolarCity, the largest residential and commercial solar installer in North America, has filed a public registration statement for its IPO (see it here). Here are a few observations we pulled from the document.